If you’re looking for a fashion, wedding, engagement, or custom made ring, Jewelry Design Gallery has the latest styles in diamond rings for women. For over thirty three years, we’ve gone above and beyond to perfect our craft in jewelry from designing custom rings done by our certified CAD/CAM designer, to mastering jewelry repair! Come to our shop and take a look at the largest selection of ladies fashion rings and custom rings throughout Central NJ. Are you looking to make your own custom style ring that only you will have? Do you have old jewelry you would like to update? We can produce a custom ring with your diamonds or ours! Our custom rings will be the unique treasure your heart and hand have been wanting! There is no ring too difficult for us to make, whether it’s a classic engagement ring or a unique one of a kind style. From start to finish, we work one-on-one with you every step of the way from the original mold, till we set the very last stone to make gorgeous unforgettable rings! So go on and dream! Come to our store located in the Towne Pointe Shopping Center in Manalapan, NJ, to get exquisite inspiration and ideas for rings you will wear for years to come. A diamond is a girl’s best friend and all larger diamonds sold at our store are accompanied by a certification from the most reputable and respected grading laboratories: The Gemological Institute of America (GIA), the American Gem Society (AGS) or the European Gemological Laboratories. 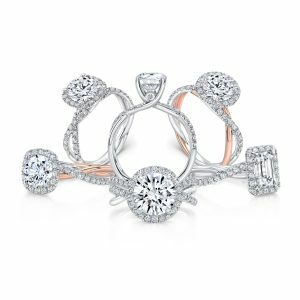 Whether you are looking for an exclusive one-of-a-kind style, a diamond infinity band, or a fashion ring, our service and selection is the best in the county. Do you own pieces that you don’t want to wear anymore and would like something more current? Perhaps you’d love to make custom rings from your old wedding band and engagement ring? Jewelry Design Gallery can turn those old wedding rings into new jewelry bling to symbolize a fresh start and a new life! Our expert CAD/CAM designer will create something you and your family will cherish for years to come. No matter the situation, our expert staff of jewelers will recreate your former rings into something you’ve only dreamt of! Please visit our store located in the Towne Pointe Shopping Center on Rt. 9 S in Manalapan, NJ, or call us today to schedule an appointment 732-536-1184.